You may think that fuel is a fleet’s highest single expense but ask any workshop manager and they’ll probably tell you otherwise. They will nod in agreement towards technicians and other personnel topping their budget costs. Within fleet workshops, your people may generate the biggest overall cost line, but they are the most valuable resource at a manager’s disposal. Their performance is an essential element in creating an efficient, productive and cost-effective operation. So, how can you improve a technician’s performance to improve workshop efficiency? Here are four ways that workshop managers can achieve this. Experienced and knowledgeable technicians are in a much better position to perform efficiently and productively. Whist recruiting qualified technicians remains an ongoing challenge for fleets, extra effort to attract the right people pays dividends in higher shop throughput, fewer repeat repairs and reduced asset downtime and maintenance costs. Ongoing technician training is also a worthwhile investment and one that pays off through overall better performance. Keeping technicians up to date on new asset and shop technologies provides the education they need to effectively service and repair increasingly more complex equipment. Readily available training programs offered by vehicle, component, tool and equipment suppliers can yield significant long-term benefits for any workshop and are a competitive advantage when it comes to attracting the best value technicians. Another proven retention approach is to recognize technician performance with advancement opportunities. Industry programs such as Automotive Service Excellence (ASE) certification from the National Institute for Automotive Service Excellence is a nationally recognized technician credential. There is proof in the value of certification in terms of workshop performance. In a study by ASE, the productivity of certified technicians in fleet shops was found to be 19% higher than that of their non-certified counterparts. 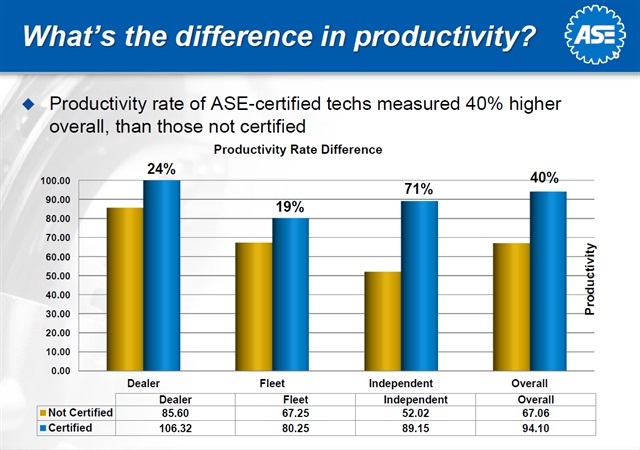 Additionally, the productivity of ASE – certified technicians across fleets, dealerships and independent shops was 40% higher than that of non-certified technicians. Are your shops arranged so there is a logical flow from the moment a vehicle arrives until it’s ready for service? Nothing hampers technician performance more than the need to continually move vehicles in and out of bays and around yards rather than having them parked where they will stay for the duration of a service event. Are the tools, equipment and supplies for your technicians needs located where they can be easily accessed? Searching for tools because they aren’t in their designated storage places is an obvious waste of time and drain on performance. A cluttered, disorganized workshop is also a safety concern too. Are your shop facilities having a negative impact on a technician? It is surprising how much the working conditions such as poor lighting quality and ineffective climate control systems can have on loss of productivity. It’s also a concern for the health and wellness issues for your staff and can have an effect them wanting to remain in employment with your business. Are your parts stored, stocked and organized effectively? Making sure parts that are needed most are available and easily accessible is a sure method for improving technician performance and overall shop productivity. Similarly, having a large store of little-used parts will have a negative impact on your budget which highlights the importance of managing a good stock inventory. Plan the work and work the plan, as the old saying goes, applies directly to achieving technician performance goals. When technicians are using their time effectively – by turning wrenches and not wasting time on unproductive chores – assets are back in service as quickly as possible, keeping downtime costs low and customers satisfied. Effective scheduling of equipment and services all play a role in improving technician performance. An obvious and logical place to start is with a solid staffing plan – one that considers technician availability based on projected workloads and fleet maintenance needs. Flexibility is also key to minimizing disruptions caused by sick days, holidays and other absences in addition to seasonal issues, planned campaigns and recalls. All insights support effective planning and scheduling that improves technician performance for workshop managers. Regularly revisiting plans and schedules to find new opportunities for productivity improvement is also a great help too. Workshop management software is an important tool in their ability to continually improve technician performance. With these solutions, workshop managers can more effectively manage shops and their personnel. There are new tools for desktop and mobile devices available, such as The Workshop Hub, an app that can have a measurable positive impact on technician performance. This tool simplifies and consolidates tasks and administrative functions for technicians, providing workshop managers with access to a wealth of data that promotes compliance and efficiency. By serving as a central location for technicians to manage and complete daily tasks, the tool includes time sheets, service and inspection documents and workshop audits. It then turns management information into real-time actionable data relating to performance and productivity of staff and resource utilization. This technology also enhances performance for technicians. By providing guided solutions, intuitive prompts and job-specific information, it helps ensure timely and accurate completion of work. Asset utilization is highly dependent on technician performance but with the right programs, practices and technologies, workshop managers can improve shop productivity and realize savings. Download our Workshop Hub brochure below and learn how it can empower your technicians to improve efficiency, productivity and reduce costs within your workshop operation. Instantly receive the latest news, guides and content straight to your inbox by registering below. Send me your Fleet management software brochure. Arrange a demo for my business or organization. Sign me up for email resources and send me a buyer's guide. You will be subscribed and emailed the guide. Souhaitez-vous plutôt naviguer sur notre site français?